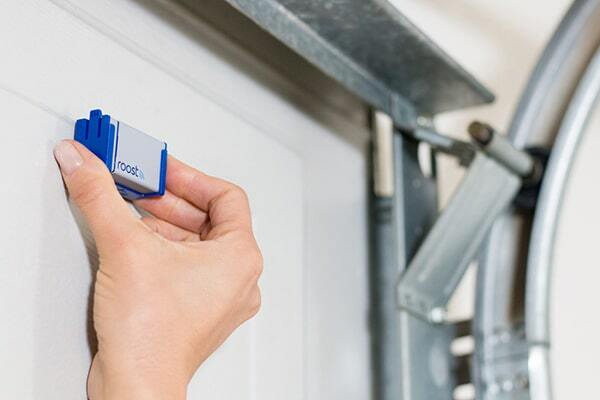 As some of you know, we launched our newest sensor, the Roost Smart Garage Door Sensor, through the crowdfunding platform Indiegogo, back in April. This decision was made to take pre-orders through Indiegogo in order to get a better understanding from “early-adopter” customers about their experience with the product before we offer it to our insurance partners. We’re happy to announce that we exceeded our expectations and sold over 800 garage door sensors to more than 600 backers. As of today, we have shipped out all of our Indiegogo perks across the US, Canada and the UK! Remind me what the Roost Smart Garage Door Sensor is again? Well, have you ever had one of those mornings where you are in a rush to get out of the house and before you know it, you’ve driven a mile down the road wondering if you remembered to close your garage door? The Roost Smart Garage Door Sensor is a small device that simply mounts on the inside of your garage door. It will send notifications via Wi-Fi to your smartphone to alert you to the state of your garage door; open or closed. You can even set alerts that let you know if your door has been open for more than one minute as you drive away! Receive smartphone notifications whenever your garage door is open. Door still open before bedtime? Door still open after drive away? Simple setup. Easy, fast and silent connection to home Wi-Fi. Convenient and Easy. Included simple mounting clip attaches to the inside of your garage door in less than 5 minutes once connected. Share alerts with your family. Unique monitoring feature allows other family members to receive notifications on their smartphones. Battery powered. Lasts for 2 years with replaceable battery pack available from Roost for $9.99. Peace-of-mind: Roost smart sensors helps to provide you with a greater sense of awareness about the security of your home. Monitor the activity of your garage door openings and closings throughout the day. Ability to adjust the frequency of the door notifications to your personal preferences or turn off completely. In a few weeks, each of our Indiegogo backers will be asked to complete a detailed survey about their experience with the Smart Garage Door Sensor. After we receive feedback from our early users, we will be able to make any changes or improvements before offering it to our P&C insurance customers this Fall. We are so excited that the garage door sensor is finally out in the world and we look forward to sharing it with more of you soon. If you are interested in purchasing a Roost Smart Garage Door Sensor for yourself, you can order it here on our website starting today! If you are an insurance carrier, please reach out to our head of US insurance Sales, Jim Strickland for additional information and a test unit.